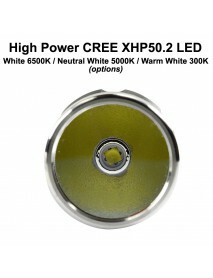 KDIY K5S Cree XHP50.2 2650 Lumens 5-Mode LED Flash.. Brand:KDIYModel:K5SFlashlight Material:Aluminum AlloyFlashlight Color:BlackEmitter Brand/Type:CREEEm..
KDIY K6 Cree XHP35 HD 2600 Lumens 5-Mode LED Flash.. 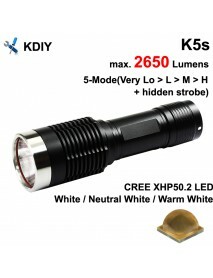 Brand:KDIYModel:K6Flashlight Material:Aluminum Alloy (Type III hard-anodized finish)Flashlight Color..
KDIY K6 Cree XHP35 HI 2000 Lumens 5-Mode LED Flash.. Brand:KDIYModel:KFFlashlight Material:Aluminum Alloy (Type III hard-anodized finish)Flashlight Color..
KDIY KF8 Cree XHP50.2 2650 Lumens 5-Mode LED Flash.. Brand:KDIYModel:KF8Flashlight Material:Aluminum Alloy (Type III hard-anodized finish)Flashlight Colo..